Comments: Bonaparte’s Gulls nest solitarily in conifers around bogs in the boreal forest zone. They migrate in small flocks through the Great Plains and winter in the southern Great Plains and along coastal areas. Similar to Franklin’s, Black-headed, Laughing and Little gulls, Bonaparte’s Gulls are differentiated by their size, thin black bill, black trailing edge on the primaries, pale underwings and pale gray mantle and wings. A triangular white patch on the wings is very conspicuous. Winter birds show a dark ear spot in all age classes. Breeding birds have a black hood and orange-red legs. 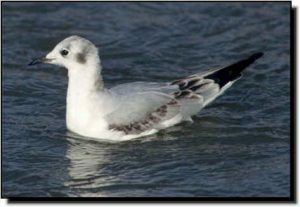 Bonaparte’s Gulls feed primarily on insects, other invertebrates and small fish.